We live in a highly digital age. For many people, large parts of their lives take place on the internet. Still, a lot of our lives also take place in physical space. The internet gives new opportunities to explore this physical space. For example, we can use it to discover new places, or to find people to discover a new place with. We can also use it to map the spaces that play a role in our lives. Queering the Map, which was started in Canada, is an online initiative that does just that: it maps the experiences and stories of LGBTQ+ people. In this article, I explore this initiative in the context of Thessaloniki. Firstly, I talk about the project in general, and then I zoom into the queer stories from Thessaloniki. Physical space plays a big role in any person’s life. We spend our lives in all kinds of places. In our homes, in the streets that we move ourselves in, in cafés, coffee shops, bars, museums, cinemas. In schools, work places, volunteering spaces. At friends’ houses, at lovers’ houses, at houses of people we may dislike. Physical space can be a great way to meet new people, friends, partners, colleagues. For some people, it is easy to meet others in this way. For others, it can be more difficult. The internet can be a welcome tool for those that struggle with meeting people in their daily life. This can especially be the case for people from oppressed or marginalized communities: the internet can be a space to find similar people, for example in terms of identity or interests. Especially when facing homophobia, transphobia, sexism, racism, or other kinds of discrimination in your daily life, it can be easier to find like-minded people online. If you have never heard of these words before, don’t worry. Before I tell you more about Queering the Map, I want to shortly explain these concepts. Firstly, the word ‘queer’. It is not easy to define what it means, as the point of the concept is to be against definitions. Generally, people use it to oppose and challenge the norms in society. It is often related to the LGBTQI+ community and for many is related to in some way not conforming to norms regarding gender and sexuality. 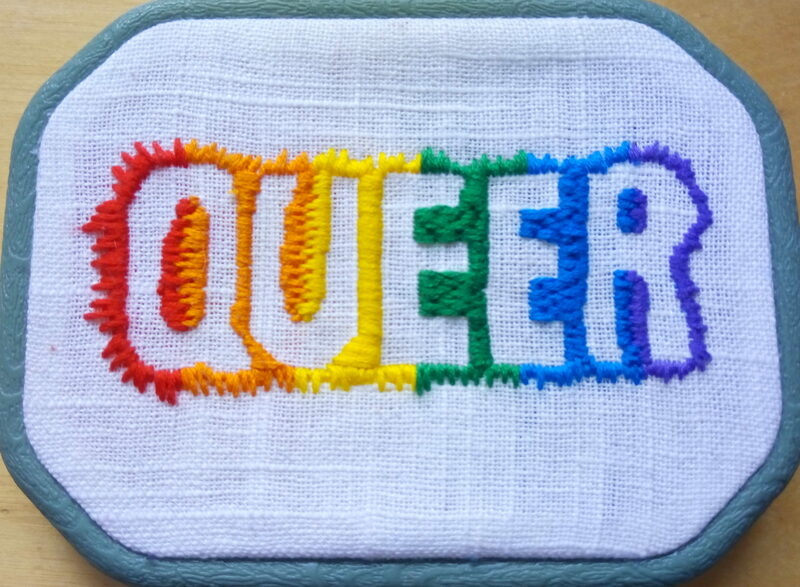 Some people call themselves queer and use it as an identity. It is also sometimes used to describe the LGBTQI+ community as a whole. Often, queer is also part of the acronym to make clear that not everyone fits in the stable categories of LGBT. Queering is related to queer, but here it is used as a verb. The term comes from queer theory, which is an academic field related to gender, sexuality, and norms. Queering is a method that is used to look at things or concepts through a ‘queer lens’, that is, by exploring, questioning and challenging the norms. In the context of Queering the Map, this means that spaces where queer people may not always be visible are ‘queered’ and these stories are brought to light. 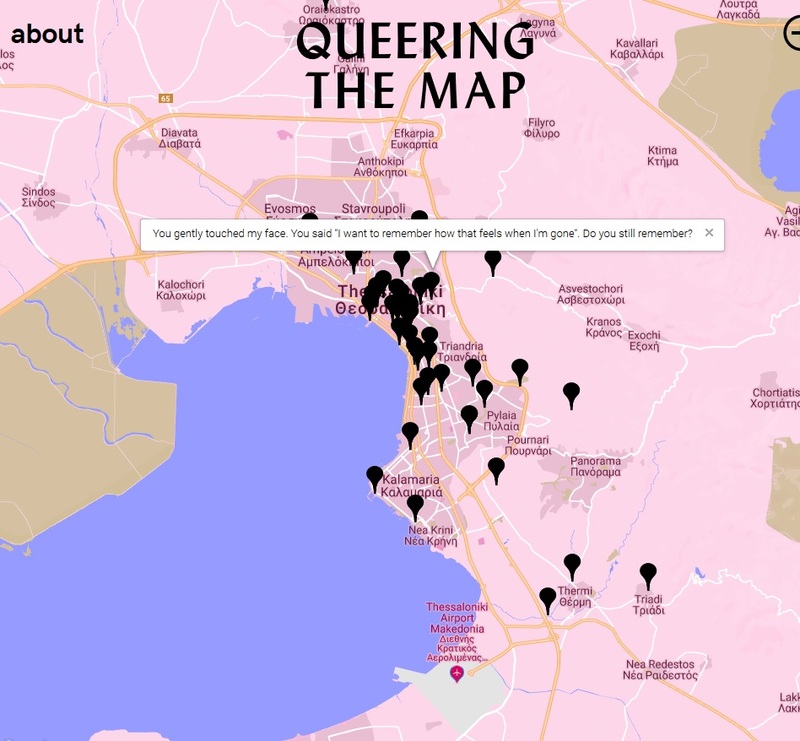 The website Queering the Map is a mapping project for which the LGBTQ+ community creates its content. The idea behind the website is to map the ‘real-life’, physical spaces that the lives of LGBTQ+ people take place in. This gives people a chance to pinpoint certain locations on the digital map and to describe any story, experience or other kind of association they have with that location. When looking at the website, you can see many pins all across the world. I will mainly focus on Thessaloniki for the rest of this post, but I highly encourage you to take a look for yourself and explore queer stories from all over the planet! When zooming in and looking at the map in Greece, you can see that the larger cities often have more stories than small places. Many places have no stories posted at all, but they probably do exist. In Greece, many of the islands also have pins. Many of the pins may come from tourists who visited those islands for a holiday, but some may also be from locals. Bigger cities often have many stories, in various places. Zooming in to Thessaloniki also shows this: the pins are spread out all over the city, and there are quite many of them. As you can see on the picture above, there are many pins around the city of Thessaloniki. I want to explore some of these pins and the themes that come forward in it to highlight some of the important aspects of the lives of LGBTQI+ people. Ah, love. Isn’t it beautiful? A commonly used slogan during pride is ‘Love is love’, which is used to argue that queer love should be equal to heterosexual love. That love is important for many people within the community is reflected on Queering the Map as well. In Thessaloniki, more than a third of the messages are in some way related to love or relationships. For example, one message reads “I really hope this becomes everything we want it to be. I can’t wait for us to live together, being able to wake up next to you everyday is more than I ever hoped for.” Another reads “you are my first everything and I love you with all I’ve got, I hope we never part ways”. This post highlights just a small part of the stories that were shared around Thessaloniki. They highlight both positive and negative aspects of life as an LGBTQI+ person. As people are free to share their own stories, it is up to the community what ends up on the map. I highly encourage you to take a look for yourself and to explore queer stories all around the world! And if you want, you can of course also add your own stories. For more Balkan Hotspot articles about LGBTQI+ people and their lives, click here.